A lovely friend of mine (Pat) came over one day and told me I had to try this recipe. She had made it for her family and she said they were mopping up the sauce with bread as it was absolutely delicious. So far everything she has recommended has been great, so I figured this should be good. Come a Friday afternoon, I was working all day setting up an office for What's Cooking Ella, I was tired, I needed a quick meal to serve to my family, and this recipe popped into my head. I went shopping after work (while my oldest son was having a haircut) and got what I needed for dinner. I came home and started dinner. This was so easy to make, hardly any preparation, I loved the simplicity of this dish, it is such a great weeknight meal. The only thing I highly recommend you do is lay aluminium foil (or tea towels) all around your frying pan all over the other elements of your cook top before you start frying the chicken as it will splatter absolutely everywhere, so to save on cleaning up time, please do this, for if you don't, all the time you have saved in making this dish, will be lost in the clean up process. I even recommend throwing down an old towel on the floor, as honestly the chicken splatters everywhere. Anyway, back to the chicken, it smelt amazing while it was cooking, and it tasted amazing once it was done. This absolutely simple recipe was delicious. My kids were placing pieces of bread into the sauce and allowing the bread to get soaked in the sauce and enjoying every single bite. 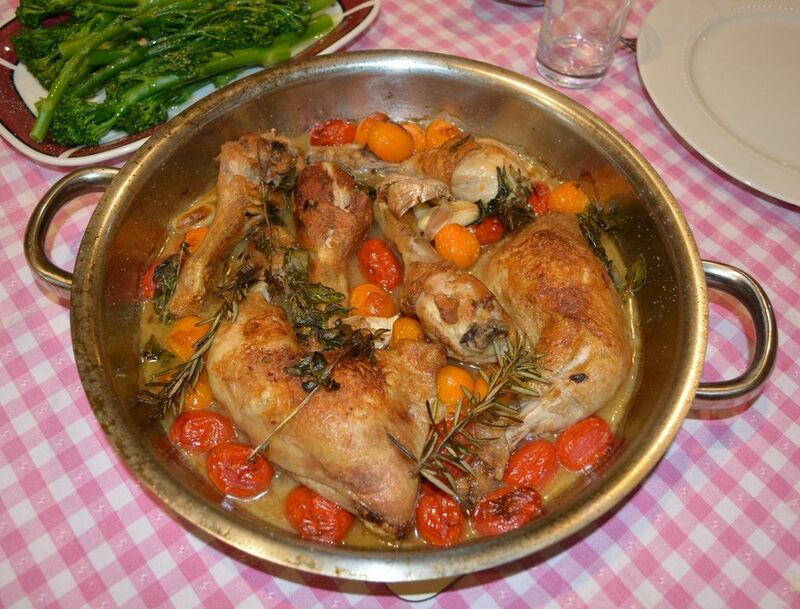 The recipe is for Chicken Marylands which I used for me and my husband, but for the kids I added chicken legs, as they like them better than the thigh. So if you are looking for a simple yet tasty dinner to make, try this, it won't disappoint. Heat the extra virgin olive oil in a large ovenproof frypan or flameproof casserole pot over medium-high heat. Add the garlic and herbs, cook for 1-2 minutes, then remove and set aside. Add the chicken and cook for 10 minutes on each side until browned, season with salt and pepper. Add the wine, to deglaze the pan, simmer for 1-2 minutes to allow the alcohol to evaporate. Scatter over the cherry tomatoes and return the garlic and herbs to the pan. 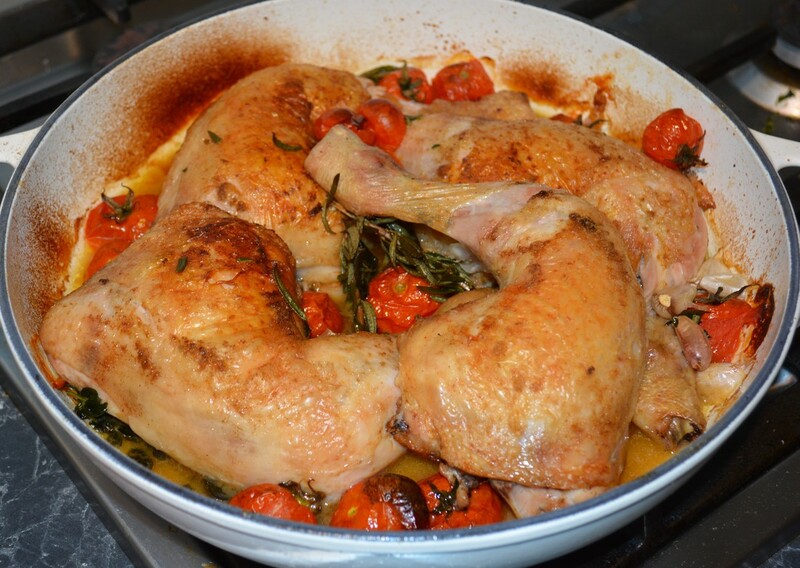 Place the pan in the oven and bake for 20-25 minutes until the chicken is cooked through. Serve hot from the oven with some crusty bread to soak up the delicious sauce.